What is the Point of a Writing Blog? I admit I started this blog partially because a lot of my writing group was starting blogs and partially because, since I’m in the submission stage, I felt the need to admit to myself that this writing thing was something that I really wanted to push forward with, and if I was ever going to get somewhere as a writer I would need some sort of internet platform. So now I’m kind of at a loss. Some of the authors whose blogs I follow just kind of blog about whatever they feel like, but they’re big names. I am more than willing to read about how their dogs have chewed through the curtains or some funny conversation with their agent. I am a nobody. No one will care if my cat has suddenly decided that we’re abandoning her every time she’s in a different room than we are. Even if they did, will they buy my book or just ask for more cat stories? Admittedly some of the authors I follow do talk about writing process, or submissions, or what to do or not to do in the genre, but again, they have clout. No one cares about my opinions about vampires or about how I think there should be more strategic use of krakens. So do I talk about my projects? And if so, how do I keep a balance between enough information to tease and entice and so much I’m either giving everything away, boring the hell out of everyone, or putting too much information out in the public eye? Do I read other books in my genre and write reviews? Comment on the genre as a whole and trends that I perceive? What do I do? How do I gather readers, people who will be interested in the stories I have to tell, and keep them interested, week after week, month after month? My first ever novel attempt was in middle school. I started a few more in high school (the longest, I believe, is 18 pages) but I would always get bored and wander off in the middle, or frustrated by something, or what have you. I took a few years off for my senior year and the beginning of college, and then began what I like to call my Adult Writing Career in 2003. That being said, I didn’t really become a writer, someone who more or less was working on writing projects year round, until the beginning of 2006. At that point I was in slogging through the middle of the first draft of a middle book on a trilogy and was in desperate need of inspiration, so I started joining writing communities on the internet. And I came across the idea of listening to specific music when writing – of having a writing soundtrack. I picked up songs from different places and tried them out (Paperback Writer by the Beatles continues to be a favorite) but nothing was really working, so I assumed I needed silence to write and moved on. Flash forward to the beginning of 2007 when I discovered a new genre of music – symphonic metal. I fell in love and started listening to it exclusively, and I discovered that, if I was listening to it while I was writing fantasy, it was a huge source of inspiration. As time has gone on, I’ve discovered different genres work better for different projects. Hard rock works better than symphonic metal if I’m writing grittier stories. Eurodance is fantastic for editing. But then, when I was working on a project late in 2008, I discovered that not just the genre, but songs themselves occasionally jump out and match a story. I found a few songs for that novel (most notably Velvet’s Mi Amore) that seemed to fit things perfectly, and sometimes playing them when I was stuck would help. Now I’m working on a trilogy (and have been for awhile – on and off since 1998 – which was high school for those keeping track – and more seriously since 2004) and somehow I’ve ended up with an entire soundtrack. Not just a few songs here or there, but ones specific to characters, ones specific to relationships, some specific to certain books. I can’t really explain it – I don’t know if I listen closer to songs now when I hear them, or if it’s just an intuition thing – because often times a song I’ve heard a dozen times will suddenly click into place. Whatever the reason though, it is fantastic. By taking the songs in the soundtrack and playing them together or in different combinations, I actually get flashes of scenes. I get dialogue and action and even the odd plot point. I don’t know if it’s just this story because I’ve been working on it so long, or if it’s a skill I’ve been developing, but it’s definitely been a huge help. Plotting out one book is hard enough – a trilogy with multiple arcs needs all the help it can get. Any aspiring writer, once they get past the “Oh this is fun” stage into the “Oh, hey, maybe I could actually do something with this” stage, invariably starts reading writing advice. And, invariably, they come across something that will tell them that they should write short stories so that they have some writing experience to dangle in front of potential agents/editors when they get to the novel submission phase of the process. I have to wonder…really? I mean, I get that it’s good to show that you can write competently enough that someone was willing to say “Here, read this” about something you wrote, but to me, comparing short stories to novels is like comparing wombats to bananas. There’s nothing that says because someone can write a moving 5000 word piece that they will be able to pull together the plot to write a longer work. (Alternately, there’s no telling if someone being able to write a 100K word magna opus will be able to be concise enough to pull off a story in 2000 words.) If you’re trying to get someone to buy your novel, it seems like a synopsis and the first chapter or so would be more useful for showing that you can string words together in a manner that makes sense and even occasionally use commas. It may just be my bias because I tend to work on much longer projects. It may be because I can’t quite justify spending the time and effort to hone a skill that I just don’t really care about. It may be because I honestly believe that not everyone can be good at both. But I just don’t get the point. This is not to say that I don’t enjoy short stories. Occasionally plotbunnies do appear for them, and sometimes they are even coherent enough that I let other people read them. I own several short story collections (especially science fiction, which I feel lends itself exceptionally well to the short form). I just don’t understand the logic that says that being able to write short stories leads to be able to write novels. Sometimes I buy into the hype and decide that I should hone the skill just because, but these phases tend to last a few weeks at best, and invariably I either end up with scenes, not complete stories, or odd little flash fiction bits, because I can’t figure out how to get any real depth to them without expanding things to novella/novel lengths. In the odd case that something turns out useful, I typically am so shocked nothing ever comes of it. And many times I get bored in the middle, wander off, and never return. So what do you think? Are short stories a necessary step to novel publication? 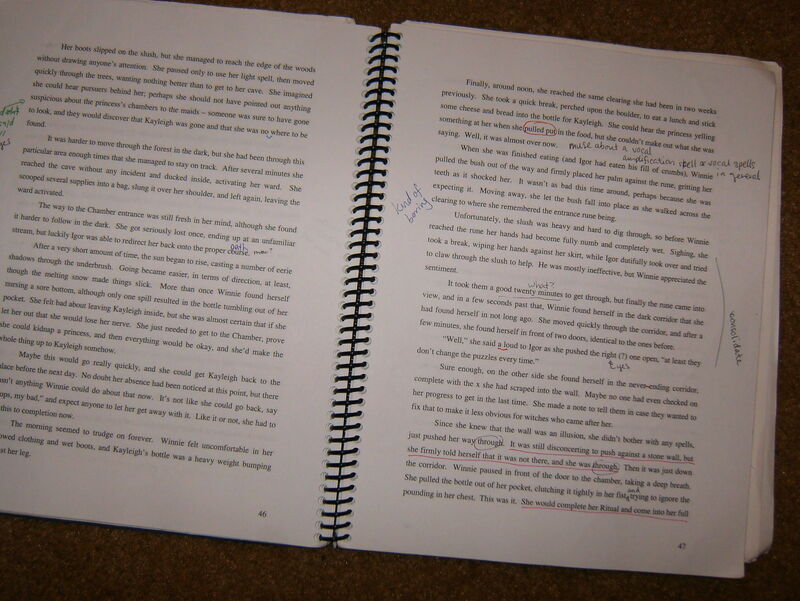 Each author’s editing process is as individual as their writing process is. Here’s mine. Step 4. Put all reader comments INTO the Master Copy. Hence the name Master Copy. I try to color code my readers. If they’re responding to specific lines, I’ll put their comment right next to it. Plot comments get put where I’ll remember to do something about it. Step 5. Read and free-edit on Master Copy. Basically this entails me reading the story and leaving comments as they occur to me. It’s more of a readthrough than a true edit. Step 6. If any major rewrites are needed, I’ll do them at this point. Step 8. I go through, chapter by chapter, and edit. Editing at this point includes a readthrough with comments, then the cutting/rearranging/rewriting portion. Then I reference the Master Copy to make sure I haven’t missed anything major that myself or one of my readers has noted. I then do a polish on the chapter, make any notes of things that affect other chapters (usually in the chapters in question in the Master Copy), and move on to the next. Step 9. After I finish the entire book, I do another readthrough and fix anything (hopefully minor things) that I missed during my in-depth edit. Step 10. Find readers (hopefully a mix of people who read the first draft and people who did not). Step 11. Repeat steps 8-10. At this point I start the submission process, but that’s a topic for later posts.